B) Player on left tries to tag the player on the right for a point. 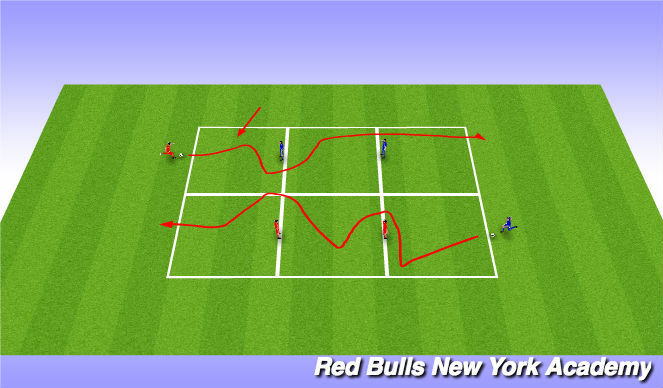 The player on the right tries to get through either left gate for a point, right gate for two points. Players switch lines after they go. Field approxmiately 30x40 above. Adjust feild as needed based on numbers. Multiple cone gates laid out randomly in grid as above. All players in the grid with a ball. Ball is the players space ship exploring the galaxy. Players must pass their spaceship through the gate and then run around their gate to get their ball. Player who explored the most gates wins. Play for 2 minutes. Coach can call out a variety of different turns and dribbles to use. Gates are now planets that must be explored in order to be the winner. Two grids laid out side by side as above, each grid is 30x15. Two defenders on each cone line, two lines facing each grid. Players have soccer ball at their feet. Defenders are on line (like a foseball player) trying to steal the ball to go back to attacking line. Attackers try to get by the defender without losing their ball. If attacker loses their ball, then they become the defender. Field as above. Feild approximatley 30x40. Two pugg goals on each end.